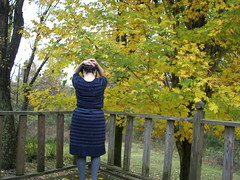 Ever since I made this dress in 2009 it has become a Winter favorite. The wool jersey is warm, like a hug, and I’m always cold these days. 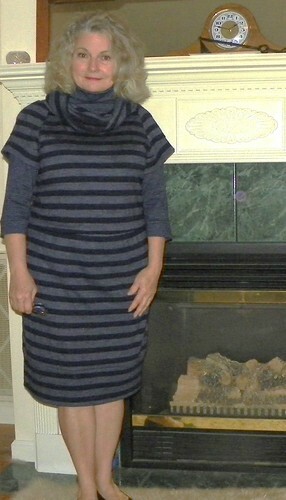 I really didn’t like the ribbing that I had tried to make work with this wool jersey dress, it doesn’t hold the heat like wool does. I didn’t like the back of my neck being exposed to drafts. The band at the bottom of the dress keep my knees cold when I sit down. The ribbing has no lycra so it stretches out and creates a funny bagging out at the elbow. And it takes a lot longer to dry than the wool, too. Besides all that, the style is wrong for me. It breaks many rules for my body type and shape. For example: the raglan sleeves make narrow sloping shoulders more narrow and sloping, the circular shape of the neckline is unflattering to a square shaped face and is too high, it should be lower. The flipping outward of the sleeve ribbing draws the eye down to my waist, away from the face. The bloused waistline is good for me but the pattern is not a good one for stripes as there is no adjustments for the slanted front waistline I have and the extra wight I carry at the high hip. And last but not least, the stripes make my a$$ look gigantic. Until I lose weight the slanted front waist and wide body behind are not things a simple remodel will remedy. There were so many details that bothered me that I didn’t wear this dress very much. And the color of the fabric, dark navy and silvery dark blue, were difficult to mix with hose and coat. Grey should work with the heathered blue but in certain lights it was a glaring mistake. Silver seemed the best accompaniment. There are a few problems I can fix in re-stylng this dress. I need to have more drape at the neckline and redo the sleeve to drawn the eye upward, away from my waist. Recently I found some small stripped wool jersey that looked like it matched the odd silvery tones of the original fabric and when it came in, YES! It would work well! How many times I have wished to find a coordinating fabric and how unusual that my wish had been granted! And a quick search of the stash revealed 2+ more yards of the original fabric. Comparing the sewn up fabric with the washed but un-sewn fabric revealed little change, maybe because I didn’t wear the dress as much as I would have liked. So, I cut off all the rayon ribbing as well as the front panel of the skit because it had developed a hole not long after the dress was originally constructed. Following the HP 1090 pattern, I turned the elbow length sleeves into “cap” sleeves and applied a band, cut a rectangle slightly less the length of the now naked neckline and created a cowl neck, and installed a bottom band, all in the same fabric. The remodeled top and dress. 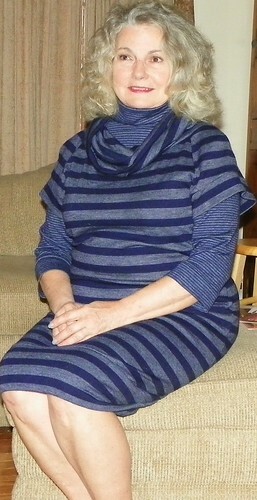 Using the new narrow striped fabric I made the funnel necked top by Christine Jonson, Travel Trio 2. I am debating whether or not to recut the sleeves of the top to full length. I have just enough fabric left for the exchange. Ahhhhh, but I’m now warm all over. No more cold spots 🙂 Sewing with wool and wearing wool is one of my favorite things about winter. Many people can’t wear wool. I’m sensitive, too, but not allergic. I believe I have a secret weapon, well, not so secret, but a weapon in the fight against itchies. I use Eucalan Wool Wash (in the Lavender scent) (I adore lavender) which contains lanolin and is left in the wet fabric, making the fibers softer than if it were rinsed out. It allows me to wear the wool next to my skin. The wool wash can be found at Amazon dot com. I’ve used it for years and can definitely recommend it to you for your wools and delicates. I like it! It looks so comfortable. I like the combination of fabrics very much. I think it is an attractive outfit on you. I am going to try the wool wash, I am sensitive to the wool and it would be nice to wear it against my skin. Perfect coordinates. See you can get what you wish for! And always, you have that gorgeous head of hair! Absolutely gorgeous restyling. I love the mix of stripes – they just take the eye away from all the spots you don’t want it. Lovely! I understand you so much… I am looking forward to fall in order to be able to wear wool. Wonderful feeling. I really like this version. The balance is better for your figures… and your hair looks awesome this way. I have to look for this pattern. I love hoodies ! What a great restyle. That’s what is so lovely about sewing – you can try again. And it really does look so nice on you, especially with the new funnel necked top. Congrats.